Up until now, there's been little physical evidence of changes at the Oleson Park Bandshell. But that's about to change. A groundbreaking is scheduled for Monday, and preliminary architect's renderings are making it possible to see how the finished project will likely appear. The next step will be putting the project out for public bids, probably in November or early December, said John Hale, who with Jim Reed, has spearheaded the effort to renovate the historic bandshell. In the meantime, the groundbreaking on Labor Day is designed to celebrate and commemorate the upcoming renovation and restoration, Reed said. Additionally, the celebration will help recognize some major donors whose contributions have been crucial to the project's success, he said. As in any fund-raising drive, every gift matters and every dollar counts, Hale said. We offer a heartfelt thank you to everyone who has participated. We offer a particular thanks to those organizations and individuals whose gifts had the most dramatic impact on the effort. Their leadership and their commitment to the quality of life in this community. To date, $960,647 has been raised, with more than 68 percent of the funds originating from the project's pacesetters: the Catherine Vincent Deardorf Foundation, First American Bank, Fort Dodge Animal Health, U.S. Department of the Interior, Iowa State Historical Society and the state of Iowa, through a Resource Enhancement and Protection grant. Duane Amhof, president of First American Bank, said his organization contributed to the project to help ensure the continuation of the bandshell's legacy and history, and what it and legendary band director/composer Karl King have meant to Fort Dodge. I think one of the biggest advantages I see is that this really is a project that unifies all of Fort Dodge, not just different parts of town, but different generations, Amhof said. The bandshell, which is listed on the National Register of Historic Places, was built in 1935-36 by the federal Works Progress Administration. The original intent of the Oleson Park Bandshell Project three years ago was to restore the aging structure. Now the project also includes seating replacement as well as a fountain and reflecting pool renovation. 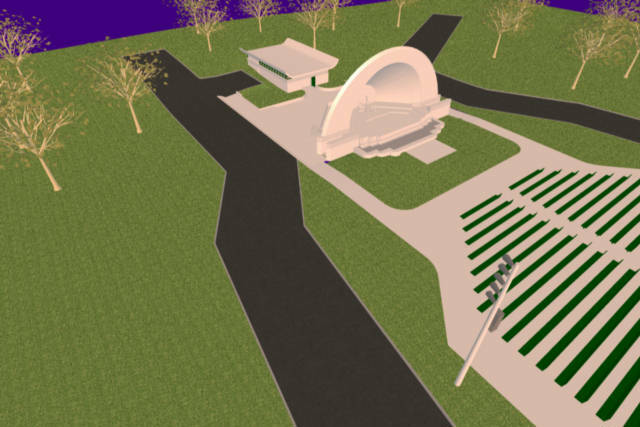 Two of the newest aspects of the project are the addition of the Karl King Memorial Plaza which will feature a statue of King, and the performers hall/public rest room facility, which will be located behind the bandshell. The performers hall, Reed said, is long overdue and has been customized to specifications set out by Duane Oley Olson, the current manager and longtime member of the Karl King Municipal Band. But the facility is being designed with flexibility in mind, Reed said, so it can also accommodate multiple bands that are booked for the same event. 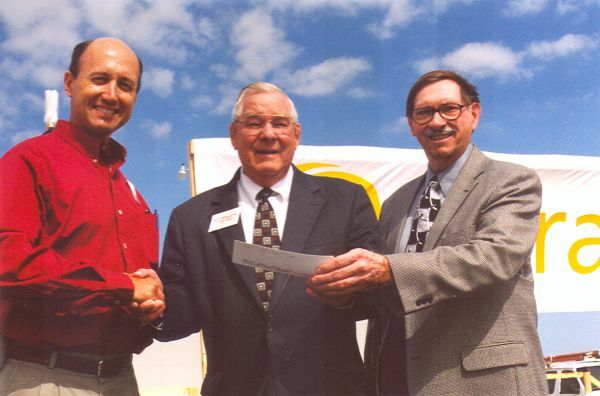 Although Hale and Reed are the two people most publicly associated with the project, many, many people have contributed to its success, Hale said, including Cooper Norman, of Prairie Architects, Fairfield; and Project committee members Todd Redenius, Carolyn Brandt, Linda Von Bank, Harlan Pfaff, Terry Lee and Jerry Rowe. Groundbreaking for the million dollar restoration of the Oleson Park Bandshell on Labor Day evening was a historic 2004 occasion and a time to reminisce a bit about the groundbreaking for the original edifice in June of 1936. built as a WPA (Works Progress Administration) project, it cost just $45,000. A federal grant and some city funds provided the financing. It's unlikely that there will be as many people at the unveiling of the restored structure as at the June 7, 1938, dedication when 15,000 attended. The 3,500 seats were filled early on that memorable evening and thousands stood on the grassy areas nearby or stayed in their automobiles. The June 8, 1938, Messenger gave highlights of the dedication, which paid special honor to bandleader Karl L. King, who was seeing his dream come true, and O.M. Oleson, donor of the park in which the pavilion (as the bandshell was called then) was built. Oleson, who is arguably the most generous and lauded philanthropist in Fort Dodge history, had another role at the dedication. He directed the Grieg Mandskor men's chorus which he had organized here 50 years earlier in the singing of his own arrangement of In Flanders Field. Edward Breen, then a state senator who had joined King and band manager Walt Engelbart in spearheading the drive for the bandshell (or pavilion) which was designed by Henry Kamphaffner, was the emcee for the dedicatory program. Kamphaffner, then professor of architecture at the University of Oklahoma, at one time lived in Sioux City where a bandshell similar (but slightly larger) is in Grandview Park. The project has stimulated band manager (and announcer) Duane (Oley) Olson and his wife, Nancy, to dig even deeper into the history of the band, bandshell and Karl King. Perhaps they can come up with the date when pavilion became bandshell. With the ceremonial groundbreaking held on Labor Day, the million dollar Oleson Park Bandshell restoration and improvement project is one step nearer. The bandshell which revered composer-director Karl King envisioned in the 1930s and was dedicated before 15,000 spectators on June 7, 1938, has served the community well for 66 years. But the years of wear and particularly the drainage problems have taken their toll and restoration is due. 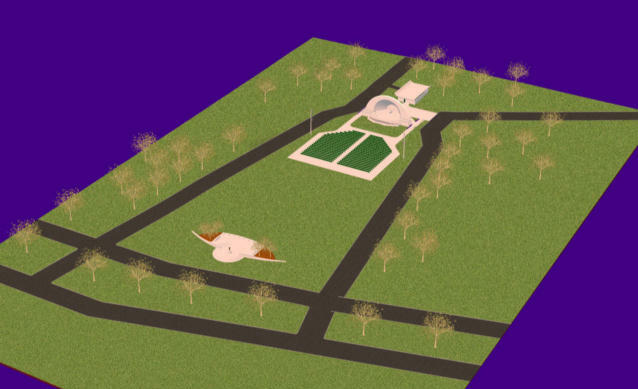 As was noted once again at the groundbreaking event, the bandshell is much like that Sioux City has in its Grandview Park. Noted architect Henry Kamphoefner designed the attractive concrete structure which boasts perfect acoustical quality. Now on the Registry of Historic Places, it is one of the city's major entertainment assets. It took only three years for the promotional committee headed by City Councilman John Hale and community booster Jim Reed to raise the necessary funds for the project. Support came from many industries and businesses, as well as individuals and organizations. Early July concerts arranged by Hale and Reed the past three years added to the funds as did government grants. 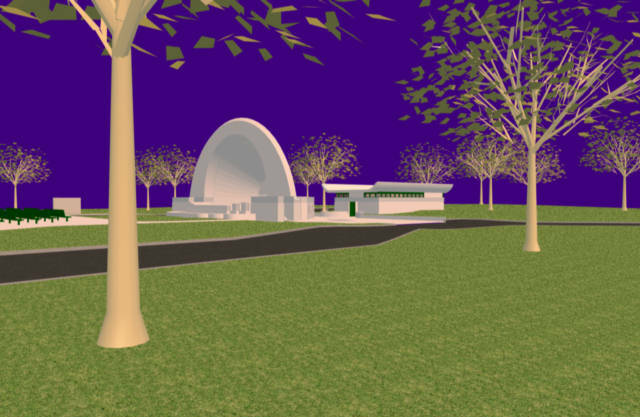 In addition to restoring the bandshell itself, the ambitious project includes addition of a performers' hall, public rest rooms, a plaza featuring a statue of Karl King, new seats and other refinements. It is only fitting that today's generation improve and update the bandshell which our ancestors provided 66 years ago. Karl King's music continues, and so does the beautiful edifice which was his pride and joy. VeraSun of Fort Dodge presented a $5,000 donation to the Oleson Park Bandshell renovation project during a September 18 groundbreaking ceremony for the dry mill ethanol plant to be located near Highway 7 between Manson and Fort Dodge. The plant plans to employ 40-50 people and will serve as a corn delivery base for farmers in a 60 mile radius. The community has given a lot to us in encouraging us to come down here, so we thought it was right to give something back, said Bruce Jamerson, the company's president and chief financial officer. We've just been so pleased with the reception of our company in the community. Jamerson said company leaders decided to donate to the bandshell project because they view it as something that is bringing people together. Organizers of the bandshell project previously reported receiving $960,647 in donations, pledges and grants as of September 5. The money will pay for upgrading the historic bandshell and starting an account to help pay for its future maintenance. The bandshell was built in 1935-1936 by the federal Works Progress Administration, and is listed in the National Register of Historic Places. Jive for Five provided entertainment during the donation ceremony.